John Hendrix tells a very complicated story in tracing Dietrich Bonhoeffer's journey of faith in Nazi Germany. The graphic format serves him well as he intersperses dense text passages with art. This is not your typical graphic novel with lots of panels and dialog. 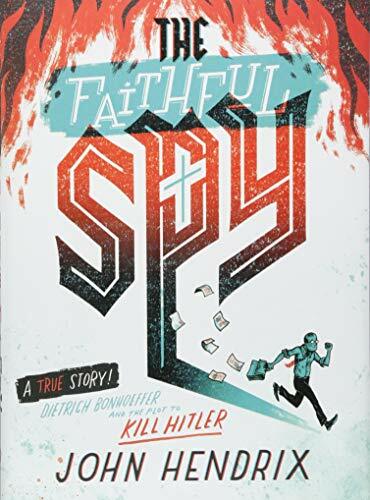 Rather, it's a creative mix of words and art to express the many facets of the Bonhoeffer's personality and the historical details of Hitler's rise to power. At the core of the book is Bonhoeffer's journey of faith. What is the role of a moral man supposed to be in deeply immoral times? Is it ever right to kill someone? Bonhoeffer struggles with these questions as he sees Hitler take control of his beloved Germany. Hendrix lays the groundwork for the man Bonhoeffer becomes by describing his time studying theology in New York when he was introduced to religious activism in the churches of Harlem, fighting against injustice and racism. It is no longer enough for Bonhoeffer to be a good person. He must do good. His actions must actively help people, not simply passively do no harm. Back in Germany, Bonhoeffer is put to the test as Hitler's Third Reich becomes increasingly evil. Although Bonhoeffer never learns the scope of the rigorously planned extermination of the Jewish people from Europe, he knows enough about the government's cruelty to feel that his only moral choice is to join a conspiracy to assassinate the Fuhrer. The graphic novel does a superb job of quickly and accessibly sketching Hitler's rise to power, from the Reichstag fire to the “Enabling Act,” which gave Hitler complete control of the government. Although a complicated cast of characters is introduced, Hendrix uses art, design, even fonts, to clarify characters and events. The book ends with an actual quote that validates this choice: “This is the end—for me the beginning of life.” It's a hopeful end to a bleak story. Better to die doing the right thing than to live doing the wrong one. Hendrix has given us a riveting story about a terrible time, a reminder of the moral weight to all of our actions. It should be required reading for everyone working in politcs, a reminder of the terrible temptations of power and appeasement.